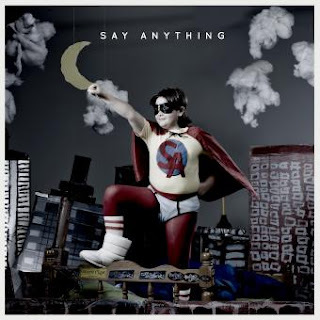 The Billionty-Oneth Geek: Say Anything's SAY ANYTHING!! Okay, I will!!! Say Anything's SAY ANYTHING!! Okay, I will!!! You know, I try to avoid writing music reviews if I can. To this date, I think I've done zero reviews, only concert reports. I just find it difficult to review music. I find it's a whole different beast than reviewing a movie, where it's more clear whether it's good or bad. With music, to me whether you like a band/genre or not, relies more heavily on your preference. So even though I don't like country or techno, I can't say they're bad because I don't regularly listen to them and therefore, have no grounds to say whether they are any good. But I was listening to this album this week and it caught me off guard, so I decided to do a little write up. Which brings us to Say Anything's latest album, the self-titled Say Anything released this past Tuesday. I'm not a huge Say Anything fan, just a casual fan. Every now and then I'll fancy a listen to Is a Real Boy, but aside from that I don't really follow them. The album opens up with a track called "Fed to Death". At first, lead singer Max Bemis' vocals and acoustic guitar hit us with an up-tempo anthem that seemingly is about a gruesome death in Allentown. A third of the way through this track, the full band kicks in and the tone changes as he sings about how the war has perversed Jesus. Heavy stuff! It's then followed by "I Hate Everyone", the Clash-esque single very much in the same catchy vain as "I Fought the Law". This leads into "Do Better" which goes for a more digital beat mixed in with some strings. The rest of the album is quite dynamic and nuanced, mixing several different genres into each song. It makes their style of music is hard to describe. At their roots, they're an emo-esque pop punk band but at the same time, they're experimental, often incorporating different instruments and even digital tracks besides the traditional guitars and drums. Though there is an evident pop punk catchiness, it isn't the sugary-coated type like All Time Low or Boys Like Girls, but is rather sharper and smarter in their lyrics, all while retaining the same types of hooks. The story of Bemis is quite an interesting one. Bemis suffers from bipolar disorder which led to quite a turbulent lifestyle in the past; one that jeopardized the band a few times. He's struggled with drug abuse, to which he was treated for at a rehab center. The past year has been a revival of sorts, where things seemed to have picked up; including getting married (to Sherri Dupree of Eisley fame) and becoming a Christian (he was raised Jewish). In fact, a common theme throughout the album is on Jesus and following His way. You might not think so because of his bluntness with language, but I think that's what helps me connect to this album. A man after my own heart. Anyhow, that's pretty much it. If you're interested in hearing something different but not too far out there, then check it out. It's mostly harmless. Yay! Later geeks!